This is Laclede's take on a security chain, which they call "Lockdown Chain". It sells extremely well, and since Laclede changed their heat treating process to make this chain even harder--62-65 HRC--we are confident it's going to sell better than ever! People simply trust the Laclede brand. They are a domestic manufacturer of many types of chain, including high-quality overhead lifting chain, tie down chains and tire traction chains. 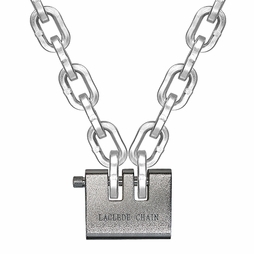 You can literally find their chains in use all over this great country--construction sites, passenger cars, marine applications, you name it, Laclede is there. They are adaptive too, willing to make changes with their engineering to keep up with modern demands. For example, their Lockdown Chain used to be thru-hardened but with a lower HRC rating. Laclede's design team determined their chain would be even tougher to cut being case-hardened yet with a much higher HRC rating. They brought this change to market quickly, and now have a security chain that stacks up against ANY competitor. 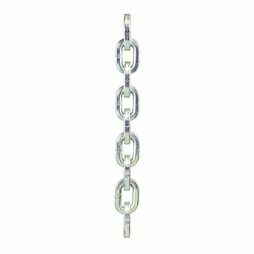 This chain is available in two sizes, 3/8" (10mm) and 1/2" (13mm). For many, 3/8" is considered the perfect size--beefy, but not too heavy or cumbersome. 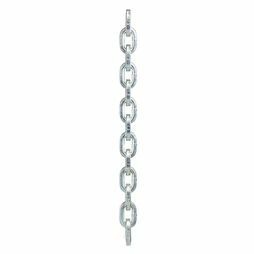 But other customers like the 1/2" size, which is the biggest security chain we offer in any brand! Both are made from quenched and tempered alloy steel with an electro-galvanized finish. 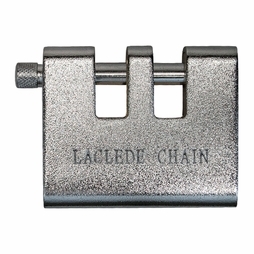 It's worth noting that Laclede is the primary chain manufacturer we use for building Grade 100 chain slings because we trust their quality so much. This chain is available by the foot, in full drums, or in kits paired with Laclede's super tough padlock (kits are discounted 10%).